This is how quickly you can die in Fusion. On the first track. Both Wipeout Fusion and Quantum Rush: Champions erred in dealing with weaponry, albeit in different ways. 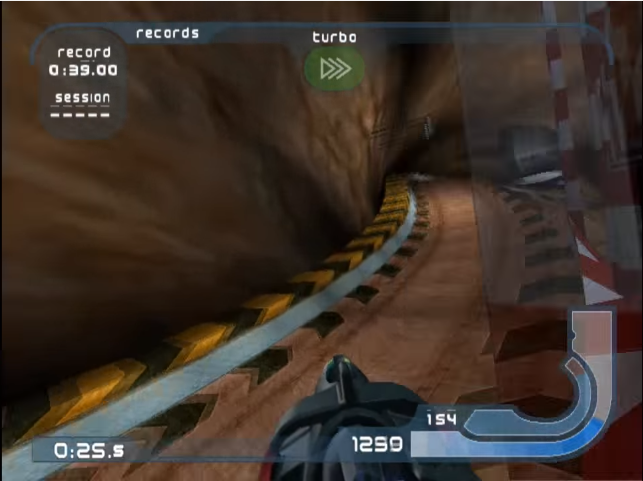 In Wipeout Fusion’s case, the weapons were, in many cases, too good. Many weapons, including missiles, fired both backwards and forwards, and, throughout the game, it’s perfectly possible to explode (losing you the race) in the first fifteen seconds. Not helping is the fact that, due to sloppy coding, some of the weapons appear to work both ways, but… Actually don’t. And it’s somewhat difficult to tell. But one thing that Fusion did relatively well was that weapon placement was considered. Some tracks didn’t have as many missiles (Which do not corner well), some don’t have many plasma bolts (Which can be murderous when used in the right way)… There’s a sort of balance, although it’s not obvious. Challenges and deathmatch further refined this. Can you score enough kills using only rockets and missiles? How about quakes and shields alone? Quantum Rush, however, has the same weapon placement for all its game modes, which doesn’t actually work. If you want someone dead in a “kill target” mission, I can guarantee you that over two thirds of the pickups still on the track are largely useless. Not helping are Quantum Rush’s own bugs, which include a weapon that, for the most part, just doesn’t seem to work: The gravity shockwave. How it’s meant to work is that it shoves racers away from the vehicle… But 95% of the time, it doesn’t do a damn thing, taking up valuable space that another weapon could use. Both Fusion and Quantum Rush, in slightly different ways, suffer from the same problems, and the same good ideas let down by poor execution. Both, for example, have multiple potential paths through the track, and, unlike some Future Racers I could name, none of these paths are technically bad. But in both games, some of these paths are poorly signposted visually, and some of these paths are cluttered to the point of frustration. In Fusion, this is most seen in Temtesh Bay, a track which has bulkhead doors that open microseconds before you actually hit them, a cave segment with hard to navigate rock formations, and some frankly silly track narrowing. 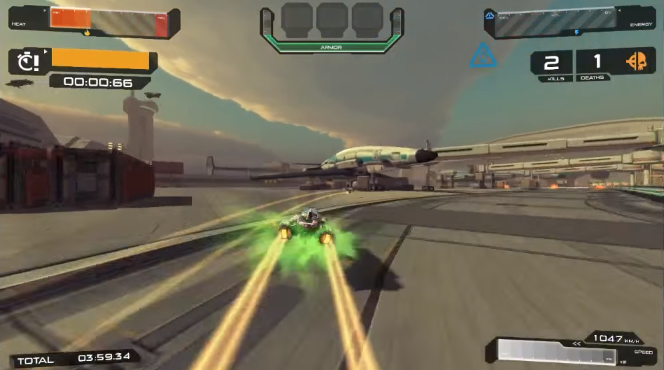 In Quantum Rush: Champions, you see similar design flaws in the Airport, with a side path filled with obstructions and narrowings in the form of cargo-plane bays and large shipping crates. Worse, the part that isn’t a shortcut is a hard right where your eyes are telling you to go ahead. This is approximately a third of a second before I end up going to the left, the alternate path. A second before that, you can’t see that turnoff. Courtesy of Wipeout Central, this is the top tier FEISAR. Like many of its compatriots, it is 90% gunmetal grey and grunge. Wipeout Fusion, it must be said, mostly sinned in this category due to visual design and grind. Upgrading craft in Fusion requires money, which requires racing tracks over… And over… And over again (Although not necessarily in the craft you want to upgrade), started as somewhat crappy versions of what they were meant to be, and, eventually, went from not-so-great craft with some interesting designs, to at least fairly average craft with some interesting designs, to good craft with some mind-bendingly dull designs, usually involving gunmetal grey. Quantum Rush: Champions, however, does… Odd things. Upgrades are rewards for earning medals… But even in higher tiers, there just aren’t that many upgrades, and they become progressively harder to unlock as you go on. What are you mostly unlocking? 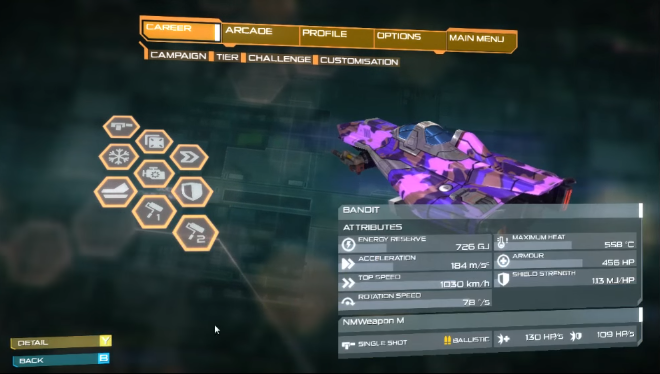 Customisation options, only one half of which (The colours) stay between “Tiers” of craft. And they, also, require unlocking through medals. It took something like 12 medals to get even this far. The pattern was in Tier 1, but had to be re-earned for Tier 2. The colour is the only one I have been able to unlock to this day. For context, originally, QRC was Quantum Rush: Online, and was going to be a purely multiplayer Future Racer with an F2P model. It had a somewhat nice garage. It had the customisation be unlocked by buying it, rather than medals, although you earned money, obviously, by racing. Upgrades, similarly, were on a monetary basis. And all of this, along with the multiplayer (Which had mostly been going alright) was thrown out when Quantum Rush: Champions was announced. 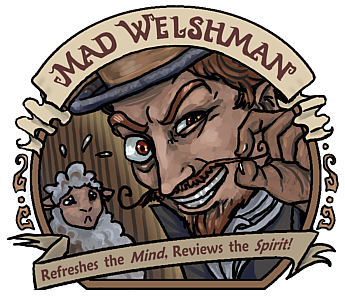 This was a mind blowing decision, to throw the baby out with the bath water, and the game suffered for it, as, since unlocks appear to be based on number of medals, you can find yourself being rewarded for slogging through a difficult challenge and getting gold with… Er… Blue #3. Thanks for the socks, Grandma QRC, but I really wanted that better armour, y’know? It doesn’t help that the customisation options, in a strange funhouse-mirror fashion to Fusion, start dull. Three shades of gray, in one colour. And every Tier, you have to unlock skin patterns all over again. Difficulty is somewhat erratic in both QRC and Fusion, but in Fusion, at least, the main causes are obvious: The tracks and the weapons. For your first track in a tournament, you could be driving through the icy Mandrashee, a relatively simple track with some quirks, and the very next track is… The dreaded Alca Vexus, home of narrow tracks, multiple chicanes and hidden corners, and, in at least one case, a broken track. …Global achievement stats like this… This is a warning sign. 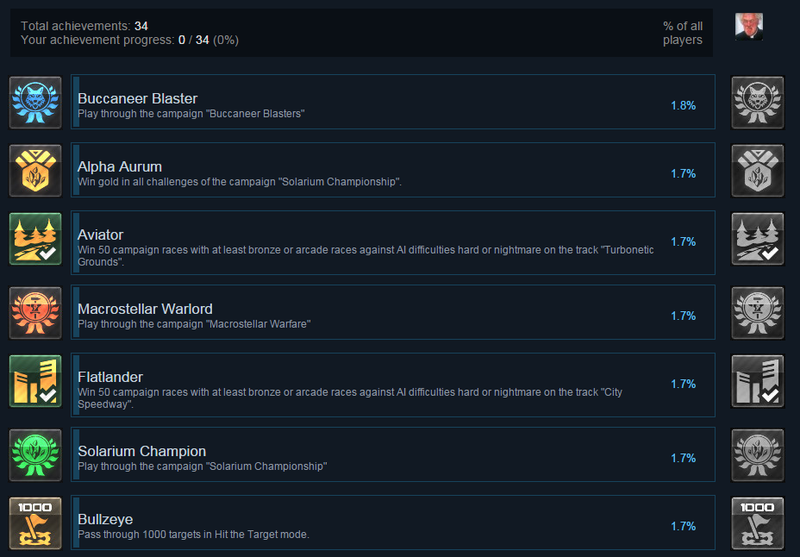 This is a warning sign that either you have done something wrong with achievements and unlocks, or you have done something wrong with playability and/or difficulty. Listen to said warning signs.